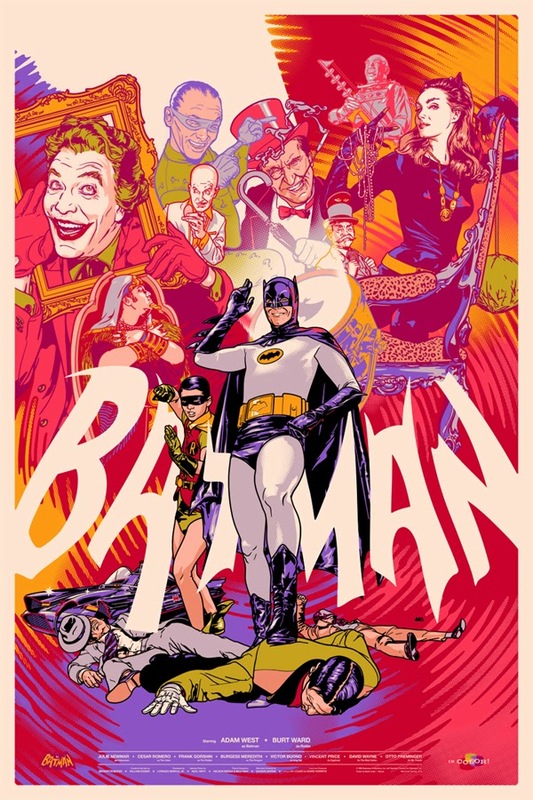 A great poster by Martin Ansin that celebrates the 60s pop-art sensation of the Batman 1966 TV show. For decades afterward, this show was reviled for the feeling it left with muggles that comics were all "Bam! Biff! Pow" silliness. Now that comic book movies are big box office and adults read graphic novels, all is forgiven, and we can appreciate the show for the goofy entertainment value it delivered. I don't think I would have become as big a comic book fan without this show. It spurred me on to buying Batman comic books in drugstores; from there I discovered Superman comics; and from there to the Justice League / Flash / Green Lantern. And then when I got a bit older, over to Marvel Comics. An addiction was born. Nuff Said!